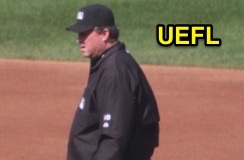 In a Not the Onion piece of news, MLB veteran umpire Gerry Davis will officiate the Little League World Series for the United States winner's bracket game on Sunday afternoon at 2pm Eastern Time. Gerry Davis will work the 2017 LLWS. Davis' equipment and uniform apparel company, Gerry Davis Sports, made the announcement Friday evening, specifying that as part of Major League Baseball's "MLB Little League Classic" between the Pirates and Cardinals on Sunday night in Williamsport, Davis will serve as the second base umpire for two innings during a Little League game before departing for his Major League assignment on Sunday Night Baseball, working the plate for the main event. Fortunately for Davis, Little League uses a modified version of the Official Baseball Rules, which is the code used throughout professional baseball, so the transition from the big to little stage shouldn't be too jarring. Davis' crew for the weekend's Cardinals @ Pirates series (playing in Pittsburgh, PA on Friday and Saturday) includes Tony Randazzo, Rob Drake, and Pat Hoberg.